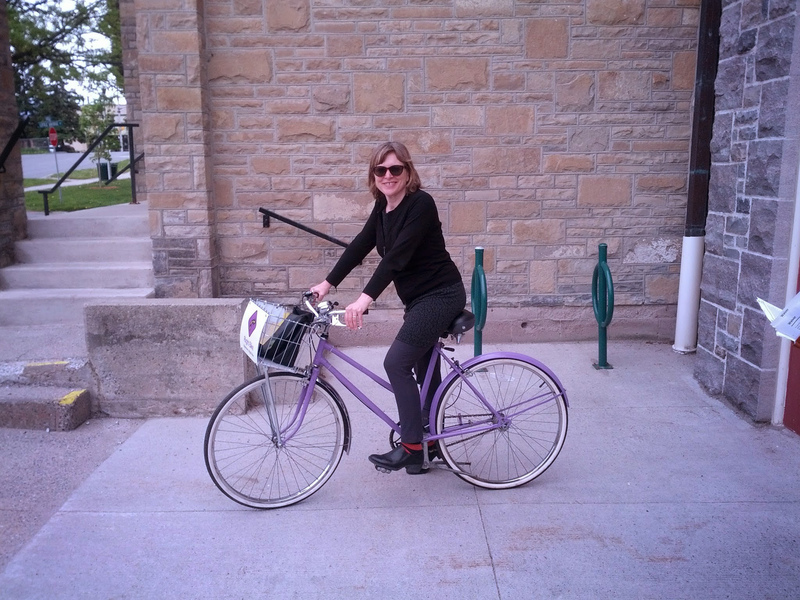 Nancy Smith Lea at the Eastern Ontario Active Transportation Summit in Almonte, Ont. in May 2014. Photo by Justin Jones. The Toronto Centre for Active Transportation will be hosting its seventh annual Complete Streets Forum on Oct. 6, 2014, at Daniels Spectrum in Regent Park. The event will feature professionals, community members and policy-makers discussing creative research and best practices for planning "complete streets" that are accessible to all residents, from children to seniors. Nancy Smith Lea has been the director of TCAT since 2008. She has been involved in research, advocacy and a range of community initiatives to improve street conditions for cyclists and pedestrians in Toronto since 1993. Nancy is a founding member of Cycle Toronto (formerly Toronto Cyclists Union) and in 2010 received a prestigious research grant from Toronto Community Foundation for her efforts in “putting active transportation on the map”. How has the Complete Streets Forum developed since it was first established, and what aspects of this year’s event are you most looking forward to? Thinking back I remember it felt like we were going out on a bit of a limb in 2010 by changing the name and focus of our annual conference from Bike Summit to Complete Streets Forum. There was lots of traction for Complete Streets south of the border, but in Canada it wasn’t really on the radar yet. We still haven’t seen anything close to the amazing growth trajectory that’s happened in the U.S. where over 700 policies have been adopted. But nonetheless we’ve witnessed an impressive change in Canada over the past four years with Complete Streets policies now adopted in Calgary, Waterloo, Edmonton, Ajax and Ottawa. At TCAT’s first Complete Streets Forum, it was very focused on the American experience, but four years later that’s completely reversed. There are now lots of Canadian stories to share, and projects and policies underway. So that’s all pretty exciting. Why are Complete Streets so important right now, particularly for Toronto? In Toronto we are clearly in need of long-range, stable transportation plans that aren’t uprooted by political whim. A good Complete Streets policy ensures that cyclists and pedestrians are considered on a routine basis as part of road reconstruction, not as an afterthought, or worse – not even considered at all. What other city(s) do you look to as a model for Toronto in terms of quality Active Transportation practices? I just got back from Montreal. Every time I go there I’m freshly impressed by something new or something I hadn’t noticed before. This time was no exception. Montreal has traffic signals that prioritize both pedestrians and cyclists by giving them a head start to get through the intersection before turning vehicles so that they are more visible to drivers. According to Velo Quebec this had dramatically reduced the number of injuries for both cyclists and pedestrians. This is such a simple yet incredibly effective measure. In Toronto we have a couple of these priority signals for pedestrians (for example at Adelaide and University) but we need a lot more of them, and it would be fantastic if they were for bikes too. Where and how will the city find opportunities to advance a Complete Streets policy as part of Toronto’s Five Year Official Plan Review? One of the best ways for Canadian municipalities to adopt a Complete Streets policy is by incorporating it into their Official Plan and/or Transportation Master Plan. Official Plans need to be reviewed and updated every five years. In August 2014, Toronto City Council adopted several amendments to the Official Plan including adopting a Complete Streets approach. While there are ways in which we at TCAT believe some of the wording could have been further strengthened to provide more clarity, nonetheless it’s a really significant step forward that this policy direction has been included in Toronto’s new Official Plan. Do you see a ‘minimum grid’ (of 200 km of bike lanes and bike boulevards to be completed in four years) for Toronto as the best way to encourage persons that may not feel comfortable cycling for their daily commute? Can you identify any streets in Toronto that have achieved, or are making progress towards, being ‘complete’ for TTC, cyclists and pedestrians? What are some of the priority projects or issues going forward for the cycling and active transport agenda in Toronto? One of the research projects we’re working on right now in partnership with Ryerson and U of T is to build a catalogue of Complete Streets projects in the Greater Golden Horseshoe. We should have that online by the end of the year. From my perspective, Toronto doesn’t have one perfect example of a Complete Street but it has a few that come pretty close. I would say St. George is a Complete Street because the City undertook a major project back in 1997 to reallocate two traffic lanes and put in wider sidewalks, bike lanes and trees. The result is that the safety and comfort is better for all road users, with reduced collisions and injuries and hardly any impact on traffic flow. The only thing missing is transit, but the subway is close by. Another example is College Street in the section where there is a bike lane, and sidewalk extensions at intersections to make it safer for pedestrians to cross. With the streetcar running down the middle, it’s covering most of the bases from a Complete Streets' perspective. Do you envision the prevalence of on-street automobile parking being reduced or transformed to better accommodate modes of active transport? How? On-street parking is a topic that we’ve been obsessed with at TCAT for a while! Parked cars are taking up valuable real estate downtown that could be much better used. TCAT has published three research reports on the topic: one looking at the Annex, a second at Bloor West Village and a third for the Danforth. [Ed's note: Theses reports provided an editorial theme for much of our spring 2011 issue of dandyhorse.] All of these studies found the same thing — that cyclists and pedestrians are better customers to these local businesses than car drivers — visiting more often and spending more money. But merchants greatly overestimate how many of their customers drive to access their businesses. We’ve also known for over 10 years (City of Toronto’s Bicycle/Motor-Vehicle Collision Study) that dooring is downtown Toronto’s most frequently reported bicycle/motor vehicle collision, that these tend to result in more serious injuries than other collisions, and that almost all cases occur on arterial roads in central Toronto with high-turnover curbside parking. Hardly a day goes by in Toronto that we don’t hear about the problems of congestion or how to find room for bike facilities or wider sidewalks. Removing on-street parking is a logical place to look to find some much needed space for moving traffic and providing a safe space for vulnerable road users. There are much better ways to use that valuable public space than storing private property. In addition to the Complete Streets Forum on Oct. 6, we hope dandyhorse readers will join us for Building a Great Bike City in Toronto, an evening of inspiration, networking, film screening and presentation by Dutch experts on Sunday, Oct. 5 at 7 p.m. at CSI Annex. Tickets are $10 in advance and $15 at the door for the general public and $5 for Complete Streets Forum registrants and Cycle Toronto members. Admission price includes one drink ticket. There will be a cash bar and refreshments available. The event is sponsored in part by the Consulate General of the Kingdom of the Netherlands in Toronto and Steam Whistle Brewery. More information is available here and individuals can register online here. For more information and to sign up for Complete Streets Forum 2014, individuals can visit here. Should the Jarvis bike lane be re-installed?